This Bat Mitzvah was held in an Orthodox Temple. This is the temple that all the congregants worship in week after week. So the challenge was to make this space, that has been seen over and over again by the same people, look unique and special. The beautiful linen and concept for this event were selected by the Ah-mazing caterer Dina Cohen. Dina not only has great taste but her ALL KOSHER meals are the delectable. The words “delectable kosher food” are rarely used together. Half of the centerpieces were manzanita branches with mini black and white photos of the Bat Mitzvah girl. Also shown are the beautiful custom prayer books. We created this muslin and burlap banner for the sweets tables. We used several pictures of the Bat Mitzvah girl throughout the party. Here is a collection of photos hanging on a frame with chicken wire and lots of butterflies. This great vintage candy display came from Violet Vintage. 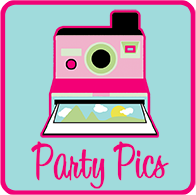 This entry was posted in Bat Mitzvah Party, candy buffet, Purple Garden Party, Purple Party, Vintage Garden Party on September 16, 2012 by Setting the Mood.